Norfork Lake fishing has been a little tough the last couple of weeks, but there are bright spots. The lake is finally starting to cool off and is currently in the upper 70's, but still warm for this time of year. 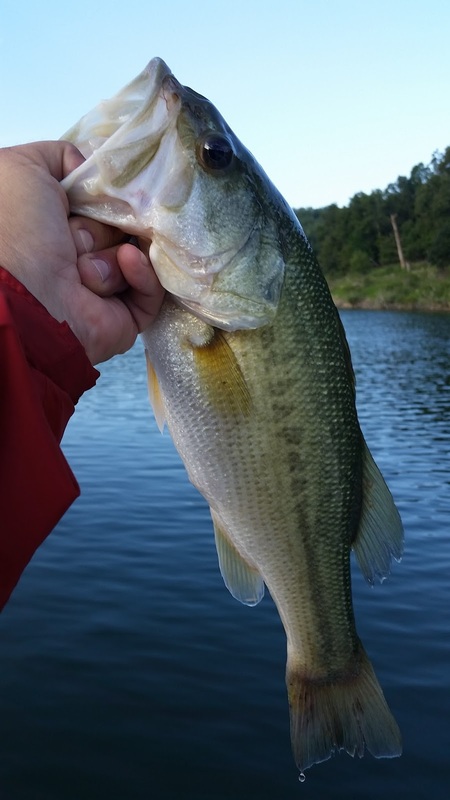 The pan fish have moved back to the brush and the largemouth bass are starting to move in tighter to the shoreline. 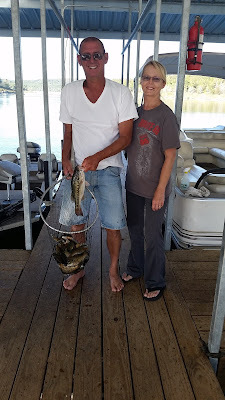 Fishing for crappie and bluegill is one of the better bites on the lake. The pan fish are on 30 feet deep brush piles. The crappie will be at all depths, but most will be 15 - 25 feet down. Vertical jigging a small spoon and jigging a grub are working very well. Live bait is also a very good choice. The bluegills are also 20 - 25 down over and around the brush. Crickets are one of the best baits to use to catch big numbers of bluegill. Large & smallmouth and spotted bass are also a good bite. Main lake deep points have been one of the best areas for me over the last couple of days. You will find these species at all depths down to 30 feet. There has been a little topwater action at sunrise and again at sunset, but they are still coming up for a Zara spook even if you don't see them surfacing. Most of the bigger fish are suspended 10 - 20 feet down and a few of them are lying on the bottom. There has been a variety of baits working over the last week; deep diving crank baits, jig and pigs, and vertical jigging a spoon. Walleye are biting fairly well. I have caught walleye in almost all types of areas. You will find them in 25 - 35 feet of water on the bottom. My favorite bait has been a 1 ounce spoon jigged off of the bottom. 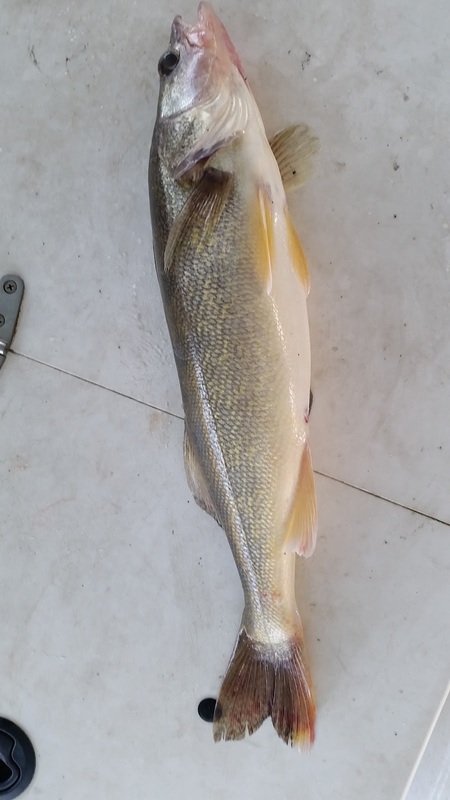 I have been catching walleye along the deep bluff lines especially close to a point, on big flats and also on points on the shallow side of the lake. As I said they are all over the place, but all at the same depth. White bass are starting to school up. 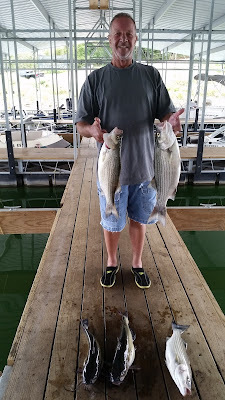 I have found small to medium sized schools of white bass in coves at sunrise and sunset. I have found these fish in 18 - 25 feet of water. Vertical jigging a spoon has been working for me. These schools are moving and chasing shad so you have to do a lot of looking, but when you find them you catch several. The striped bass and hybrid bass bite is still off. These fish moved from the dam area in the later part of September and have been very difficult to find and when you do find them they are unwilling to bite. They have scattered out, but should start to school up very soon. As the water temperature continues to fall the striper bite will continually get better. The Norfork Lake level is falling slowly and currently is at 553.31. The surface water temperature is 77 - 78 degrees and falling very slowly. The creeks and coves are stained and the main lake is clear.